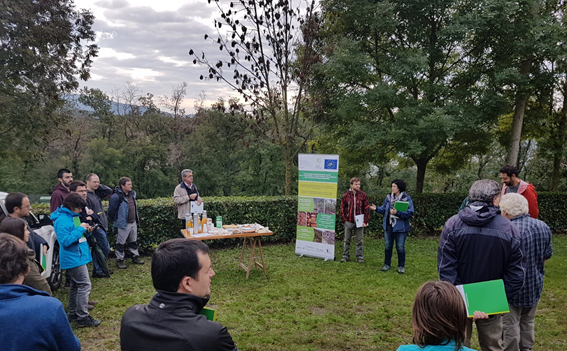 On 20th October 2018, the project Life MixForChange was presented in the framework of the General Assembly of the Catalan Association of Forest Engineers, entitled “Let’s adapt – innovative forest management models for climate change adaptation”. In this meeting the management options of mixed forests were discussed to integrate the adaptation of forests to climate change and the promotion of bioeconomy. The field visit took place in Sant Quirze of Besora (Barcelona province), in a mixed stand of scots pine with oak, beech and valuable broadleaved species including maple and service tree. In these stands there are ongoing silvicultural treatments focused in the selection and promotion of future crop trees and in density reduction, to increase the vitality and growth of the stand. The visit included demonstrative-experimental plots installed in framework of Life MixForChange project to monitor the impact of the silvicultural interventions in the forest structure, biodiversity indicators and water regulation.